Bluetooth 4.1 technology offers 30 feet operation range with good performance. Significantly lower power consumption and more stable signal Hi-Fi lossless audio transmission than previous versions. Works with almost all MB Factories' cars with a MMI AMI MDI audio port. Stream audio through AMI MMI input in car stereo and enjoy your favorite music from phone/tablet/MP3. Depending on production date and the specific configuration of the car. The original box of MMI AMI must has been preinstalled or installed in original audio host, and which is usually installed in the copilot's glove box or center armrest box, please check the configure list of the car or the car getting ready to be assembled before you make the purchase. It does not support Audi or VW Car with AMI MMI MDI Port. It does not support read and display your entire iPod library from your iPhone, iPad or iPod touch on your car display. It does not support skip and control music playback using original steering wheel. Please use 5V standard charger to charge. Do not use quick charger/ flash charger/ fast charger for the output voltage is over 5V and may destroy it. 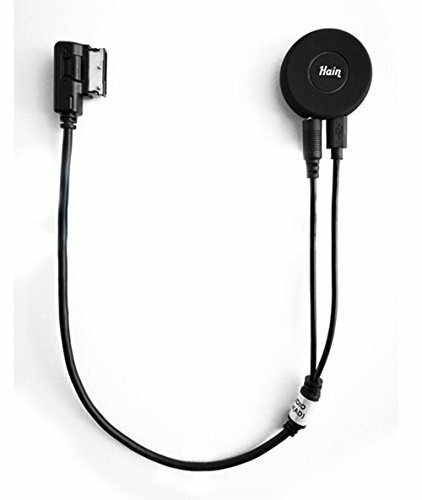 Bluetooth Media Streaming for 2011 or EARLIER MERCEDES: S-Class, SL-Class, CLS-Class, CL-Class,SLK-Class, C-Class, E-Class, GLK-Class,ML-Class and R-Class with Comand APS NTG 2.5 3 4.5 with AMI MMI interface: w211 w204 glk 350 e350 w212 2011 c300 ml320 cla c250 w203 e320 c63 w163 slk gl450 etc. Plug, Pair, and Play. It is easy to use and works with iPhone X 8 7, 6 plus, 5, 4 and 3 as well as Android Samsung phones. Designed to work with CAR FACTORY installed AMI port. AMI cable is included with this bluetooth car kits. Updated Bluetooth 4.1+ EDR Technology: Provides lower power consumption and wider compatibility. Car handsfree made easy route your phone through your car speakers. Make calls and listen to music. Super Sound: Original Mercedes AMI MMI Audio System and Bluetooth 4.1 Hi-Fi lossless audio transmission for crystal clear phone calls and music. No road noise or echoes. Easy to use: Control almost all receiver and phone functions with a single button. it remembers your device for easy pairing every time you enter your car. If you have any questions about this product by Hain, contact us by completing and submitting the form below. If you are looking for a specif part number, please include it with your message.